Download scheme brochure and application form | Apply online. Rajasthan Housing Board invites applications for allotment of 452 flats in Indira Gandhi Nagar Housing Scheme Jaipur year 2014. The Board offers 144 G+3 flats for Lower Income Group in Sector-9 and 208 G + 3 flats for MIG-A in sector - 4,5 & 7 in IG Nagar Jaipur. The estimated build-up area of LIG flats is about 508.336 square feet while the estimated build- up area of MIG- A flatsis 804.00 square feet. The estimated cost of LIG flats is about 10.95 Lakh for first floor while HIG flats, it is 16.55 Lakh. 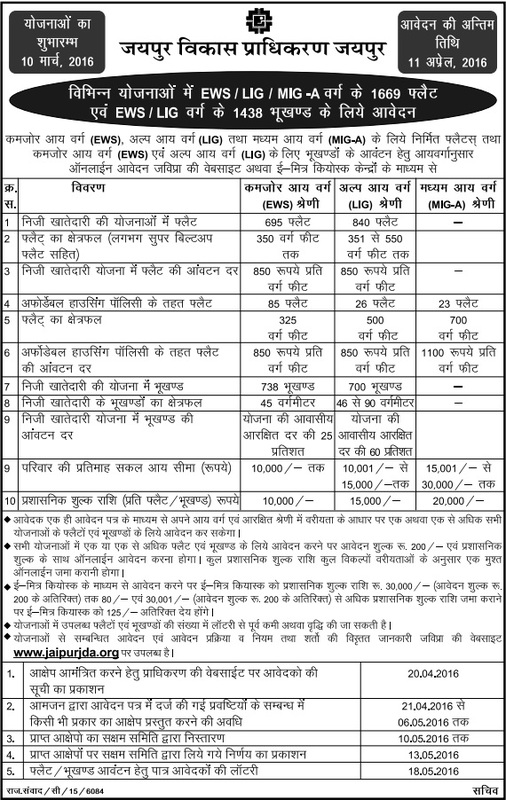 Rajasthan Housing Board invites applications for allotment of 93 flats in Mansarovar Housing Scheme Jaipur (Mansarovar Yojna) under the self finance scheme year 2014. The housing board offers 93 (B+S+12) multistorey flats for Medium Income Group, category B in Sector 12, Block B, Dwarkapath in Jaipur under the new Mansarovar Housing Scheme. The estimated super built-up area of offered flats is about 185.83 sq mtr and the estimated cost of flat is Rs. 51.50 Lakh. Rajasthan Housing Board has launched new housing schemes for EWS, LIG and MIG flats in different localities of Udaipur, Bhilawara, Gulabpura, Dungarpur, Chittorgarh, Jodhpur, Nagaur, Jaipur, Mahala, Churu, Bharatpur, Nainwa, Beawar and Anta. The housing board is offering a total of 2037 flats under the new schemes. Registration for the scheme started on 15th October and the last date of registration is 14th November, 2014.